This article was originally published by Pyxera Global. In 2017, the William Davidson Institute at the University of Michigan collaborated with the Global Alliance for Clean Cookstoves (the Alliance) to assess the lessons learned so far on the Alliance’s journey to accelerate the clean cookstove industry. This blog is based on the article “Accelerating an Impact Industry: Lessons from Clean Cookstoves” first published by the Stanford Social Innovation Review on June 1, 2018. Announcing the launch of the Alliance in 2010 at the Clinton Global Initiative, then Secretary of State, Hillary Clinton, remarked that the Alliance would “work toward the goal of 100 million homes adopting new clean stoves and fuels by 2020. Our long-term goal is universal adoption all over the world.” By bringing together leaders from both the public and private sectors, the Alliance aimed to build a clean cookstove industry that could deliver this vision. For decades, the development community has been investing in programs that seek to harness the power of business to address social challenges. Not only has this meant investing in private enterprises, but also investing in developing the policies, information, institutions, and infrastructure that define the industries in which these enterprises operate—what we call impact industries. Of course, before the Alliance launched there were many efforts to invest in the clean cookstove industry. But like many impact industries, these were fragmented efforts that operated independently of each other and lacked an integrated vision. This resulted in a lack of investment and coordination, and market environments that make it challenging for enterprises to be profitable, never mind reach scale. Rather than being another independent effort, the Alliance was formed to be what we term an Impact Industry Accelerator (IIA)—an entity charged with catalyzing an entire impact industry. Rather than being another independent effort, the Alliance was formed to be what we term an Impact Industry Accelerator (IIA)—an entity charged with catalyzing an entire impact industry. Almost three billion people around the world still cook over open fires or with biomass such as wood, charcoal, and dried animal dung. The stoves they use are inefficient and expose the use to a variety of toxic gases, chemicals, and airborne particulates. These pollutants cause a variety of health issues, including pneumonia and heart disease, and disproportionately impact women and girls who do most of the cooking. Apart from health impacts, these inefficient stoves and biomass fuels have impacts on climate change and the environment. The Alliance aims to better understand the links between improved cooking technologies, and changes in these negative outcomes. It works globally to advocate for improved standards for cookstoves and fuels, to promote investment in enterprises that provide them, and to educate and inform consumers about their benefits. At the country level it works with local governments, non-governmental organizations, and the private sector to develop and execute country level plans to achieve these objectives. For this research we interviewed Alliance staff and partners in Washington, D.C., Kenya, and Bangladesh. In these discussions we talked about what the Alliance has done to accelerate the clean cookstove industry, but also things that the Alliance and other organizations have not addressed yet. 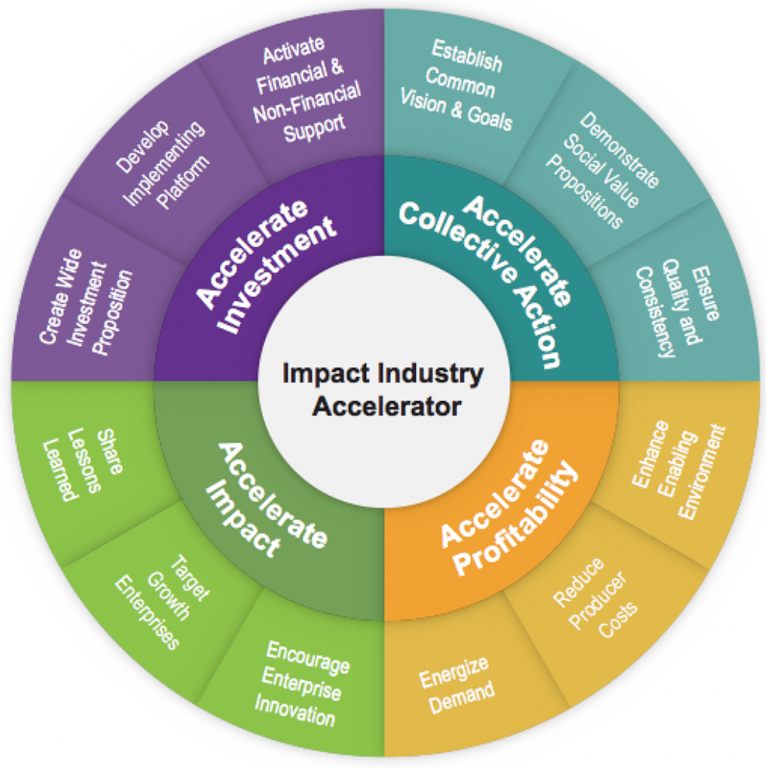 This led us to identify four different, but interconnected stages of impact industry acceleration—accelerating investment, collective action, profitability, and impact. The Alliance didn’t implement these strategies sequentially, as there were overlaps and iterations. Indeed, the Alliance found itself investing in activities from all four stages at any given time, albeit at different intensities. activated financial and non-financial support in the form of organizational commitments of funding, and access to data, tools, and intellectual capital. ensured quality and consistency through the development of product standards, testing, and certification that enabled consumers to compare across products and manufacturers. energized demand by investing in behavior change and awareness campaigns to inform customers about the dangers of household air pollution. shared lessons learned that enabled enterprises to implement best practices and increase their probability of success. By 2017, the Alliance had experienced important successes in accelerating investment and collective action and its efforts focused on this latter stage. As it looked to the future, the Alliance sought to place greater emphasis on accelerating profitability and impact and the creation of a healthy market for clean cookstoves and fuels. However, this shift will likely require new thinking in terms of internal capabilities, as well as new external partnerships. This framework provides a roadmap for that transition. While we developed this framework and roadmap for the Alliance, we think these principles can be of benefit to other IIAs in similar impact industries. Frameworks such as these can facilitate improved strategies and approaches that increase the probability that IIAs can turn their visions of impact into reality.